The top picture is the one I took at the museum. The bottom is one I Googled. This was taken at the Tehran Conference. 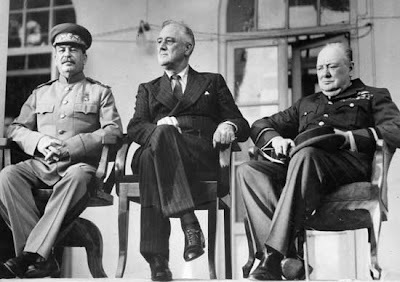 From left to right: Joseph Stalin (Soviet Union), Franklin D. Roosevelt (USA), and Winston Churchill (United Kingdom), (nicknamed the Big Three). I'll keep this short since I know hardly anyone but me cares. 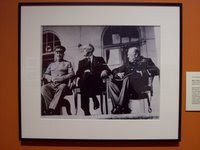 Basically, these three met in Tehran, Iran to discuss how to take down Nazi Germany. This was in 1943, during WWII. They agreed that the US and UK would support the USSR attack on Germany's eastern border and they discussed what would become D-Day. This picture is what Josh and I have decided we want to get to hang in our living room. The first is the picture I took at the museum. The second is a picture I found on Google. The third is basically the same but taken by a different photographer. 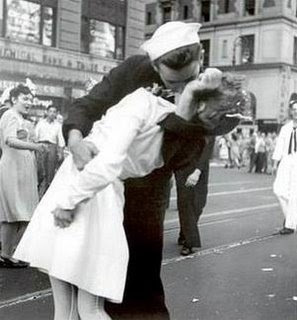 They were taken on V-J Day (Victory over Japan Day). This sailor was running down the street kissing any woman he could find. 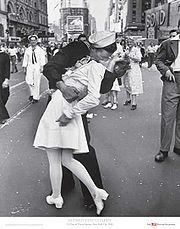 Because of the flurry of excitement and celebration, the photographers did not get the names of the sailor or the woman. 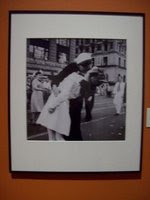 Last week Megan and I went to Gordman's and saw a really nice framed version of the first picture "Kissing the War Goodbye". Joshua and I went back on Saturday to buy it, and of course it was gone. I was so disappointed. We'll find it somewhere.